A pinched nerve is an uncomfortable nuisance that can be a hindrance on your day to day life. The symptoms of pain or numbness can be irritating, and sometimes last days or even weeks. 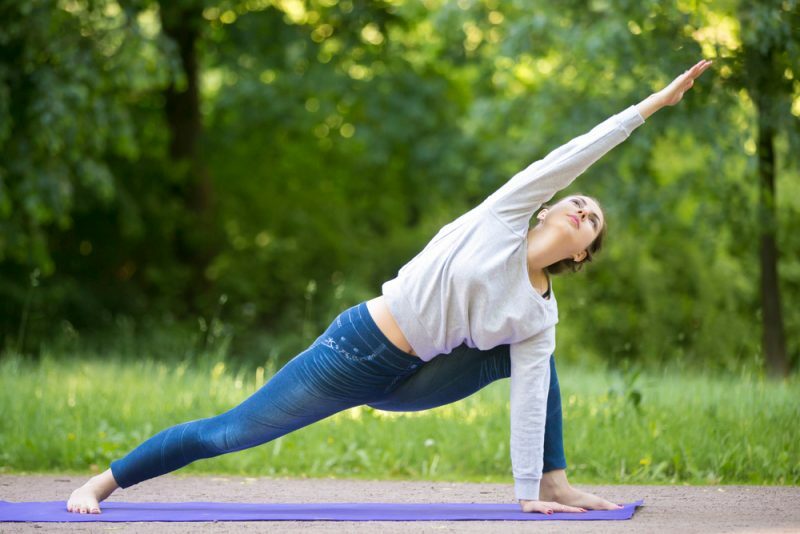 If you are currently dealing with a pinched nerve, yoga is a practical treatment option, as certain poses can help take pressure off the nerve and relieve pain. Over time, a consistent practice can even help prevent future pinched nerves from occuring by strengthening the muscles surrounding nerves. The severity of a pinched nerve varies, and some may need medical attention, so be sure to consult with your doctor to find the best treatment option for your situation. However, yoga can be a complementary treatment to other methods of treating a pinched nerve, and sometimes has the potential to fully heal the nerve and diminish the pain on its own. A pinched nerve happens when an excess of pressure is put on a nerve by bone, muscle, cartilage, or tendons, disrupting the normal function of the nerve. This compression can affect the nerve itself, the myelin sheath that protects the nerve, or both. It results in a an uncomfortable sensation or pain in the area, which can happen anywhere in the body, but is most often associated with back or neck pain. There are a variety of causes of a pinched nerve. It could be as simple as a repeated or consistent body movement, such as sitting the same way at your desk or leaning on your arm. Age-related spine and bone deterioration can put nerves more at risk of experiencing pressure. Consistent poor posture that puts your spine out of alignment can also affect your nerves. Other factors like weight gain, pregnancy, a herniated disc, rheumatoid or wrist arthritis, or intense physical activity can lead to a pinched nerve. The symptoms of a pinched nerve can vary. Numbness can occur in the area where the nerve is located, or a decrease in sensation. There could also be a consistent sharp, burning, or aching pain. This pain may stay in the location of the pinched nerve, or could radiate from the source, causing pain in a larger area. There may be a tingling sensation, commonly referred to as a limb “falling asleep”. As the irritation on the nerve continues, these symptoms can become consistent, rather than dissipating within a few minutes. 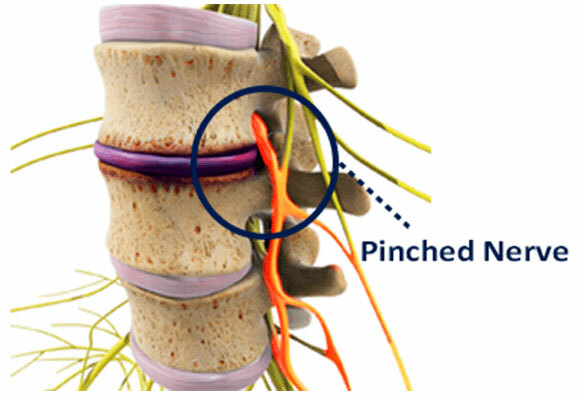 Typically, symptoms from a pinched nerve will go away within a few days or weeks and do not require treatment. However, for those who are experiencing longer symptoms, or need quicker relief, there are surgical and non-surgical options, including physical therapy, medications, steroid injections, or neck collars for those with symptoms in the neck. If you are looking for immediate relief from a pinched nerve, or simply want to save yourself a trip to the doctor’s office, targeted yoga moves can help you diminish your symptoms. While yoga isn’t the cure-all for all pinched nerve situations, it can be a great first step to take to attempt to mitigate the symptoms before turning to more serious treatments. As you try out a specific pose that targets your pain, be sure to be gentle, move slowly, and not push yourself. Everyone is different, so listen to your body to figure out what is and isn’t working. The lower back is particularly prone to pinched nerves, as it is weight-bearing and does a lot of twisting and movement day to day. Sphinx Pose, or Salamba Bhujangasana, is a gentle backbend that helps to strengthen the spine and reduce pressure in the low back. Start on your stomach, with your legs hips-width distance apart behind you. Bring your elbows below your shoulders, with your forearms paralleling each other on the ground. On an inhale, begin to elevate your chest. Begin on your back with you knees bent and soles of your feet on the ground. Ensure a block is easily accessible. Begin to lift the hips up to create a diagonal line from the head to the knees, while keeping your glutes soft but core engaged. Keep your neck relaxed and roll your shoulders away from your ears. Grab for your block, and align it horizontally along your tailbone. It can be on either the second highest or highest level, depending on how deep you want the back bend. You can keep your knees bent, or straighten your legs for a deeper restorative posture. Hold the pose for 30 seconds to a minute. To release from the pose, remove the block out from under you and slowly roll down from your shoulders to your glutes. Knees to Chest Pose, or Apanasana, targets your lower back muscles and hips, helping to stretch and relieve tension. Begin by lying on your back, with your feet flat on the floor and knees bent. You may choose to lie on top of a blanket or two yoga mats if your back is sensitive. On an exhale, bring your knees to your chest, placing your hands below your knees. If your flexibility allows for it, you may also wrap your arms around your knees, holding opposite elbows. Ensure that your back is fully flat on the ground. You may feel an urge to lift your glutes and hips off the mat, so be mindful of lengthening your spine and keeping them grounded. Your shoulders may also want to rise towards your ears, so release tension and focus on keeping them flat to your mat, along with your spine. If it is comfortable, you may rock side to side or back and forth for a light massage on your spine and low back area. Hold the position for 30 seconds or longer, and then release. The spine is one of the most common places for a pinched nerve to occur, due to the large range of movement of the back, as well as the intricacies of the vertebral column that surround the nerves in the area. Downward Facing Dog, or Adho Mukha Svanasana, is a great option for a pinched nerve in the spine, as it decompresses the spine and releases tension in the back. Your head should remain active, with your gaze focused in between your legs. Continue to push through your index fingers and thumbs, and lift your tailbone as you elongate your spine. Before settling into stillness, you may choose to bend one knee and then the other to open up the hamstrings. Once still, hold the pose for 30 seconds to a minute, and then release back down to your knees. Extended Side Angle Pose, or Utthita Parsvakonasana, is another pose that elongates the spine while also gently twisting it, providing an all-over back relief. As you are working towards healing a pinched nerve, keep in mind that more intense forms of yoga may not serve you. If you choose to go to a class or do your own flow, listen to your body and stay away from any poses that may halt or hinder your recovery. Explore these poses and see what works for you, and you’ll hopefully soon be free of your symptoms.